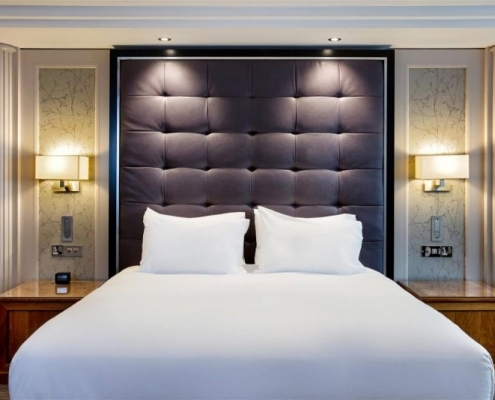 Ideally situated in the city centre of Glasgow, the Hilton Glasgow offers its customers the perfect combination of convenience and style with the best amenities around. This award-winning hotel provides stunning views of the city of Glasgow. 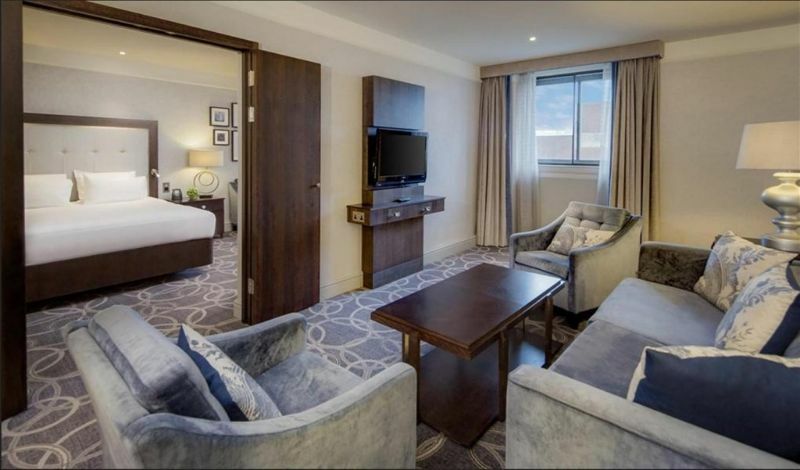 Whether the purpose of your trip is exclusively for business or pleasure, the Hilton Glasgow accommodates everyone. 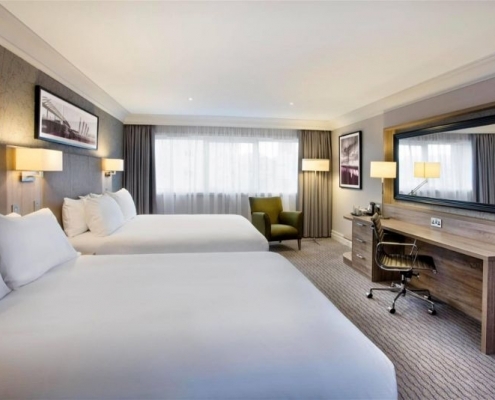 The Hilton Glasgow can be easily accessed via the M8 and is also in walking distance of Glasgow’s Central Station, making it very convenient to get to. 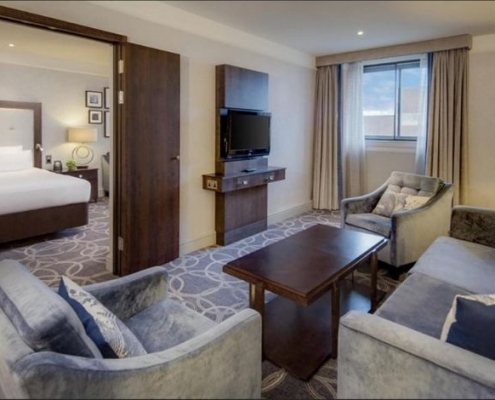 Additionally, the Hilton Glasgow is only a 20-minute drive from Glasgow International Airport. Situated just 10 minutes away from Glasgow’s famous fashion destination, Buchanan Street, customers can spend their day browsing some of the city’s finest shops and restaurants that Glasgow has to offer. 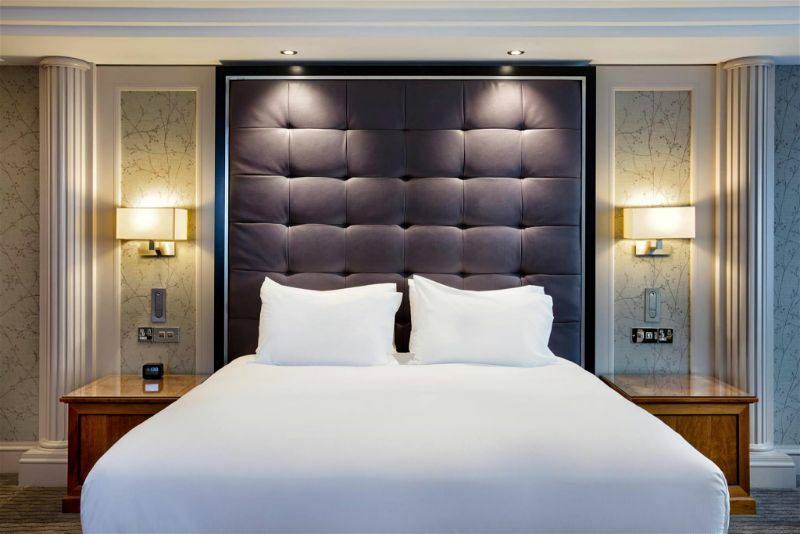 Whether you are on a business trip or are looking for a space to unwind for the weekend, the Hilton Glasgow offers first class services for all of its clients. With over 15 meeting rooms available, the Hilton Glasgow provides bespoke, corporate spaces, which are ideal for meetings, conferences, and exhibitions. State of the art equipment is provided for all of your needs, such as video conferencing, secretarial service and high speed WiFi. The sophisticated executive lounge at the Hilton Glasgow provides the perfect set-up to do business, with snack offerings that are available throughout the day. Spending time as a family is very precious. At the Hilton Glasgow, everything is taken care of to ensure that you and your family are happy and relaxed as soon as you arrive and also throughout your stay. This family friendly hotel hosts a range of facilities, which are certain to make an enjoyable stay. 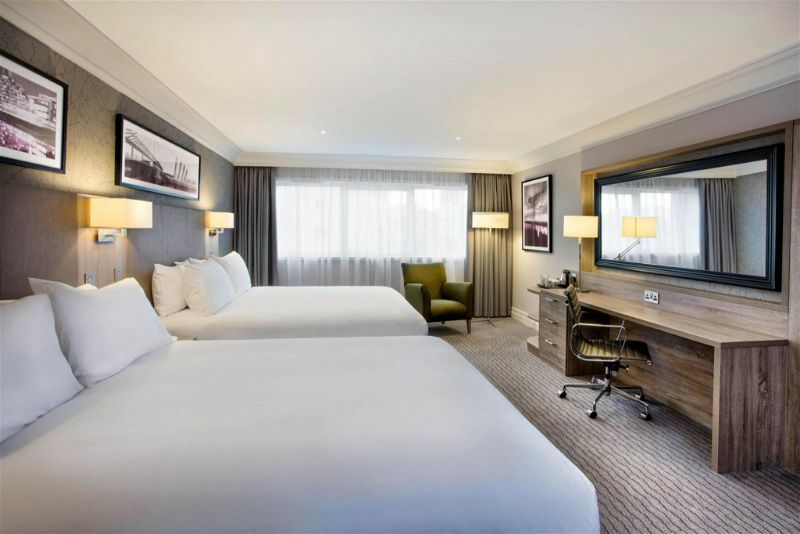 With interconnecting rooms available, along with the new ‘Double Double’ and Deluxe Double rooms, the Hilton Glasgow provides spacious rooms with a chill out area where the family can fully kick back and relax. Additionally, everyone can eat their way to happiness with the availability of the children’s menu in the hotel’s restaurant. Children from 5 years and younger can even eat for free from the children’s menu. High chairs and cribs are available upon request to ensure that your children are comfortable and safe throughout the duration of their stay, giving you peace of mind and allowing you to relax fully. Offering style and sophistication, the Hilton Glasgow serves as the perfect venue for a range of events. With an entire floor dedicated to hosting event spaces, customers can be assured to find the ideal venue for their event. The renowned Grand Ballroom provides a remarkable space, which hosts up to 1,000 guests. The Meetings and Events team are committed to accommodating your every need. Whether you are hosting a conference, prom, graduation ball or any other celebratory events such as engagement parties or weddings, the function rooms at the Hilton Glasgow are sure to dazzle your guests. From finesse to fitness, the Hilton Glasgow offers the exclusive LivingWell Health Club, which is so much more than just a gym. 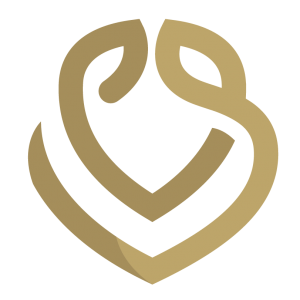 Offering the latest gym equipment and facilities that are designed to suit your needs, the LivingWell Health club creates a unique and friendly atmosphere, which is designed to support you in your journey to health and fitness. The steam rooms, saunas, spas and therapeutic health and beauty treatment rooms available at the Hilton Glasgow will leave you feeling relaxed and ready for the day ahead.